Finding a caring senior service agency to watch over a grandparent, parent, spouse, or other senior in need can be daunting. Do you know what qualities to look for in a senior service agency to ensure you’re choosing the best for your loved one? You want a caregiver who enjoys caring for others. A caring senior service will be sure to employ people who can share their time and skills willingly with others. These are the people who don’t shy away from tedious or hard work, who always have a smile on their face, who listen with enthusiasm to stories, and whom you miss when they are away. The first quality of a caring senior caregiver is that they care. Do you need a caregiver with training in a specific condition? Or maybe someone who is naturally nurturing? Either way, you want to know that the caregiver you hire understands and can respond to the needs of your parent. Ideally, a caring senior service will provide on-going specialized training for their employees. Click here to learn more about the training that ComForCare caregivers go through. The best caregivers go beyond their basic duties. If they see a potential danger or a simple task, an efficient caregiver will perform the chore without being asked. They do this, not to earn a reward, but because they have integrity and love their work. Your parent deserves a caregiver who can take care of their needs without needless instruction or incentive. Any caregiver can smile. The best caregiver shines with a positive attitude. Caring senior services will send caregivers whom you can’t wait to see. They turn into friends because of their positive personalities. They are willing and enthusiastic about the care they give, and more importantly, the people they care for. Your parents, grandparents, spouse, aunt, uncle, or other loved one will feel genuinely at ease knowing they are in good hands. If you don’t know where to find a caring senior service that employs caregivers with all these qualities, look no further than ComForCare. 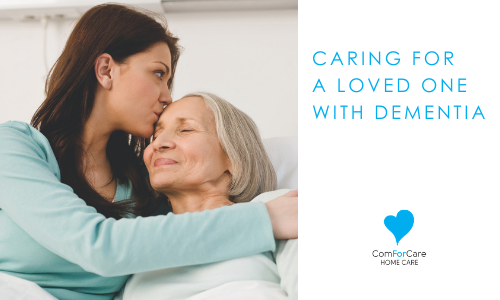 Your family member will be safe and comfortable at home with a ComForCare Caregiver.